A good dog dish can help dogs big and small eat healthier—whether that means slowing down or aligning their bodies for better digestion. Here are our top picks across the board. From digestive issues to back and neck pain to even diseases like Canine Megaesophagus, dog feeding dishes and stations can prevent a lot of problems—and can even help you keep your floor clean from messy eaters. A lot of dog owners don’t realize that the way a dog eats can affect their pooch’s health. So, whether you’re looking for feeding bowls, elevated stations, or even upright seats, there’s sure to be a helpful pick for you and your dog in our list. If your dog has problems with neck strain or bloating from swallowing too much air, then the Pawfect Pets Elevated Dog Dish is a great pick, no matter the size of the pup! With heights of either 4 inches or 12 inches, your small or large dog won’t have to bend over when he eats. If your dog has arthritis, ease their pain during dinner with the Pawfect Pets. Their digestive health will also improve without the stress of craning their necks. Not only is it great for health, but it’s also sturdy so you don’t have to worry about your dog knocking it over. 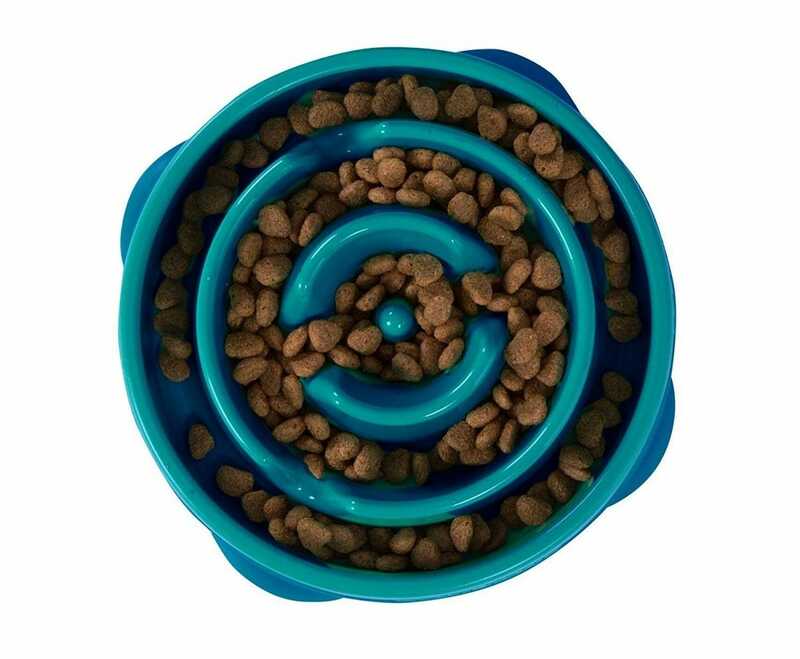 There are silicone rings around the openings of where the bowls go, which prevents leaking through the stand or movement of bowls—creating a secure and clean feeding area. While the Pawfect Pets is great for health and stability, there are other great options out there, especially if you want more functionality. If you like the idea of an elevated feeding station and you want to take advantage of the space below the bowls, check out the IRIS Elevated Feeder for your small, medium, or large pup. The IRIS is a plastic, airtight box that holds your dog’s food in the base while holding bowls in the lid. 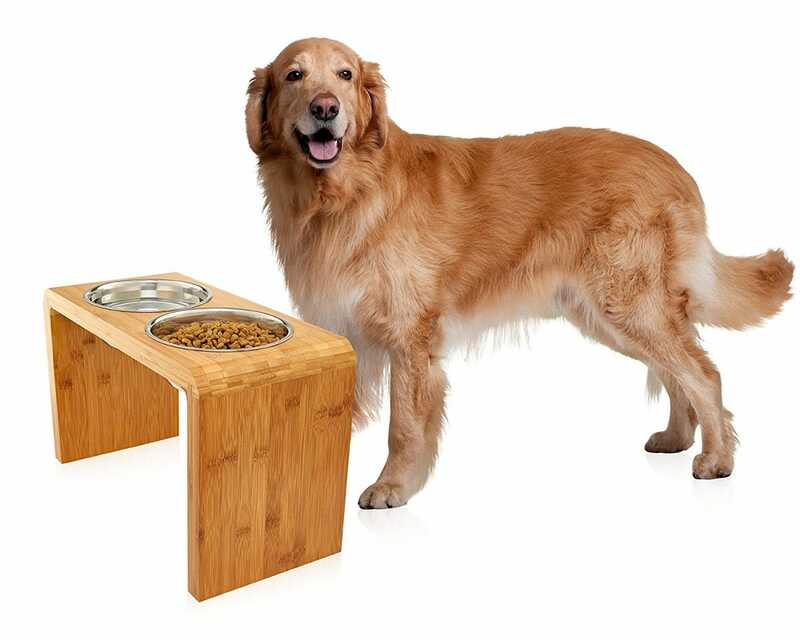 Elevated dog stations like the Pawfect Pets are great for helping dogs get to their food at the right height, but what a bowl that will help with the actual eating? The OURPG bowl helps dogs get all their food without the dog knocking the bowl around or spilling the food over the brim of the bowl. This bowl is shaped differently than your average dog bowl, being 7 inches at the highest edge and 5 inches at the lowest. This helps the dog reach the food without the food spilling over (which is especially helpful for dogs with short snouts). While part of the mess comes from pushing food over the brim of the bowl, another source of stray kibbles on the floor is because the dog pushes the actual bowl around. The OURPG bowl has a rubber ring around the base of the bowl to prevent movement of the bowl—so no more loud bowl clattering or spills. Another option for messy eaters and drinkers is the Neater Feeder Express Pet Bowls. 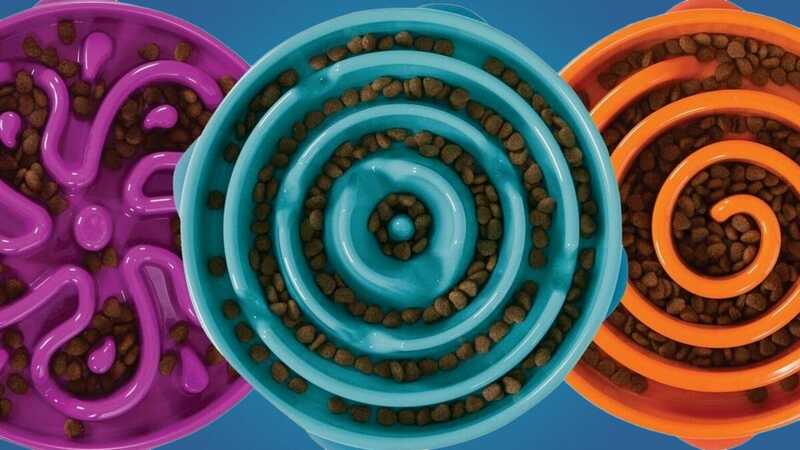 With different sizes for small, medium, and large dogs, this feeding station catches extra kibbles your messy eater drops out of the bowl, and can even collect water from messy drinkers, too! If your dog eats too quickly, he can swallow too much air—ultimately causing stomach problems. It can even become dangerous if the dog bloats too much since bloating causes the stomach to expand (and a really bloated canine stomach can interfere with their heart). With the Outward Hound Fun Feeder, your dog eat much slower than with a normal bowl. Not only will he have slower digestion, but the maze like structure is mentally stimulation compared to just gulping down a few huge mouthfuls of food. Having to chase the dry, wet, or raw food inside of the bowl is a great mental exercise in foraging for dinner—and with 5 styles, your dog will never get bored if you want to mix it up day to day or week to week. Aside from helping your dog eat at a slower pace, it can also be a fun treat if you fill the Outward Hound Fun Feeder with water and freeze it for your dog. Another fun alternative is the Buster Dog Maze, which is great for treats and even full meals! This feeding station isn’t for every dog, but for the dogs that need it it can be a, literal, life saver. If your dog has issues swallowing or digesting food (and the speed at which they eat isn’t the problem) consider checking out the Bailey Chairs 4 Dogs. This chair is especially helpful for dogs with Canine Megaesophagus, which is where the esophagus muscles are too weak to propel the dog’s food to the stomach, so fluids and food buildup stay in the throat due to poor swallowing reflexes—eventually causing pneumonia when food gets into the lungs. Placing the dog in the chair to sit and eat vertically will eliminate buildup in the esophagus and allows the dog’s food to digest properly. 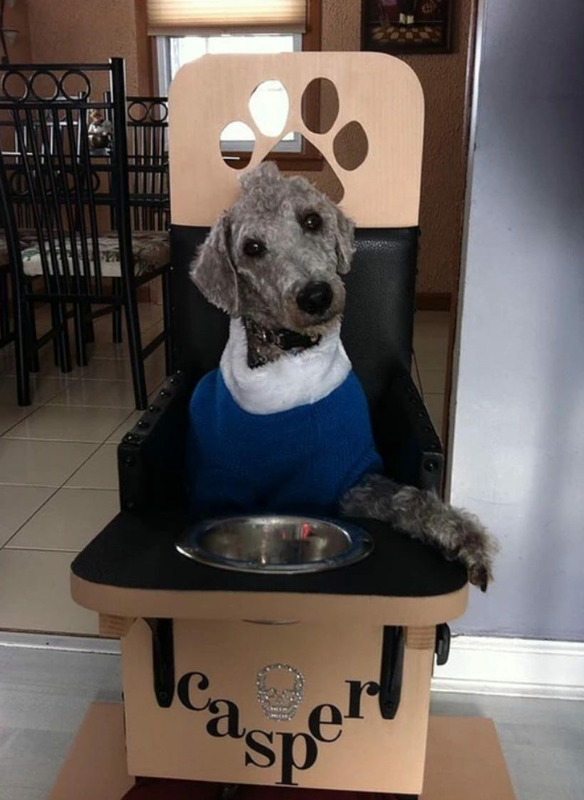 Thanks to the solid construction of the Bailey Chair you’ll never have to worry about properly position your dog and instead can worry about the more challenging aspects of having a dog with megaesophagus—like training them to stay in the chair for 20+ minutes to finish the digestion process. If you want a simpler way to combat Canine Megaesophagus, check out the Brodie Bowl Elevated Dog Bowls. Not only are the bowls elevated like in our Pawfect Pets entry, but there’s a ledge for your dog to stand up on to reach the bowl—helping the food go down more easily.